Pay while you play; Amazon introduces a way for developers to introduce physical tie-in products through their own apps. Paying for in-game products is an established monetization strategy, but now Amazon is turning that around. When developers publish their app on an Android store through Amazon's new Mobile App Associates API, the app developers can sell items through the Amazon marketplace from within the app. 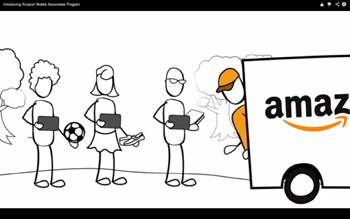 Amazon calls this "digital bundling." "Until today, developers have only had three methods to monetize their apps or games: selling them outright, going 'freemium' with in-app purchasing or subscriptions, or using mobile ads," Amazon announced through their blog on Aug. 27. The Mobile App Associates API offers developers another method to sell their product, earning them a six percent referral fee on purchases made through the program. Board game publisher Days of Wonder utilized the program by selling the physical board game through its Android version of Ticket to Ride. Amazon has offered hypothetical examples, such as offering health-related products for nutrition apps or selling a toy version of a character in a game that also enables the consumer to play as that character. Other suggestions are a bit sillier. "[If] the boss at the end of a stage in your game is a giant three-headed wolf, sell the popular 'Three Wolf Moon' t-shirt from Amazon," the announcement stated. It may be more advantageous for some companies to sell physical merchandise themselves outside of games rather than use Amazon as a middleman, but it's an option nonetheless.